When neuroscientists tested expert meditators, they discovered something surprising: The effect of Buddhist meditation isn’t just momentary; it can alter deep-seated traits in our brain patterns and character. Daniel Goleman and Richard Davidson tell the story of this revolutionary breakthrough in our understanding of how meditation works. 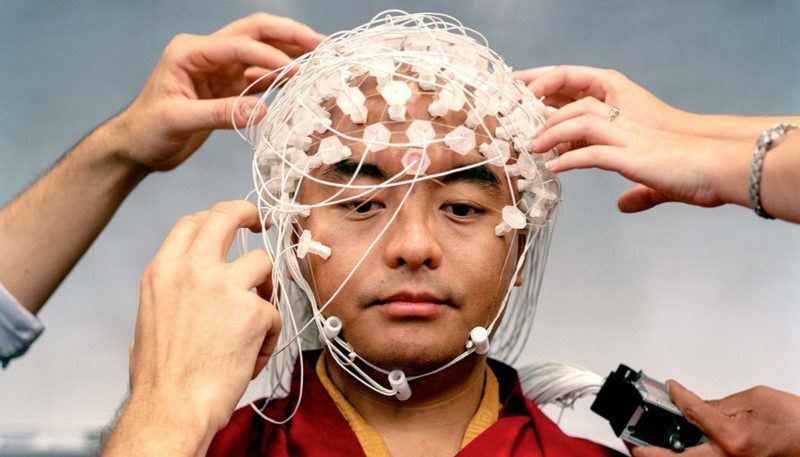 Expert meditator Yongey Mingyur Rinpoche is fitted with 256 thin wires to measure his brain waves while he meditates. Photo by Brian Ulrich. One cool September morning in 2002 a Tibetan monk arrived at the Madison, Wisconsin airport. His journey had started 7,000 miles away at a monastery atop a hill on the fringe of Kathmandu, Nepal. The trip took 18 hours in the air over three days, and crossed ten time zones. Richie Davidson had met the monk briefly at the 1995 Mind and Life meeting on destructive emotions in Dharamsala, but had forgotten what he looked like. Still, it was easy to pick him out from the crowd. He was the only shaven-headed man wearing gold-and-crimson robes in the Dane County Regional Airport. His name was Mingyur Rinpoche and he had traveled all this way to have his brain assayed while he meditated. After a night’s rest, Richie brought Mingyur to the EEG room at the Center for Investigating Healthy Minds, where brain waves are measured with what looks like a surrealist art piece: a shower cap extruding a spaghetti of wires. This specially designed cap holds 256 thin wires in place, each leading to a sensor pasted to a precise location on the scalp. A tight connection between the sensor and the scalp makes all the difference between recording usable data about the brain’s electrical activity and having the electrode simply be an antenna for noise. As Mingyur was told when a lab technician began pasting sensors to his scalp, ensuring a tight connection for each and placing them in their exact spot takes no more than fifteen minutes. But Mingyur, a shaven-headed monk, offered up a bald head, and it turns out such continually exposed skin is more thickened and calloused than one protected by hair. To make the crucial electrode-to-scalp connection tight enough to yield viable readings through thicker skin ended up taking much longer than usual. Just as Mingyur began the meditation, there was a sudden, huge burst of electrical activity on the computer monitors displaying the signals from his brain. Most people who come into the lab get impatient, if not irritated, by such delays. But Mingyur was not in the least perturbed, which calmed the nervous lab technician—and all those looking on—with the feeling anything that happened would be okay with him. That was the first inkling of Mingyur’s ease of being, a palpable sense of relaxed readiness for whatever life might bring. The lasting impression Mingyur conveyed was of endless patience, and a gentle quality of kindness. After spending what seemed like an eternity ensuring that the sensors had good contact with the scalp, the experiment was finally ready to begin. 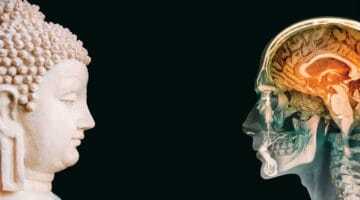 A precise analysis of something as squishy as, say, compassion demands an exacting protocol, one that can detect that mental state’s specific pattern of brain activity amidst the cacophony of the electrical storm from everything else going on. The protocol had Mingyur alternate between one minute of meditation on compassion and thirty seconds of a neutral resting period. To ensure confidence that any effect detected was reliable rather than a random finding, he would have to do this four times in rapid succession. From the start Richie had grave doubts about whether this could work. Those on the lab team who meditated, Richie among them, all knew it takes time just to settle the mind, often considerably longer than a few minutes. It was inconceivable, they thought, that even someone like Mingyur would be able to enter these states instantaneously, and not need much time to reach inner quiet. Richie was fortunate that Buddhist scholar John Dunne—a rare combination of scientific interests, humanities expertise, and fluency in Tibetan—volunteered to translate. John delivered precisely timed instructions to Mingyur signaling him to start a compassion meditation, and then after sixty seconds another cue for thirty seconds of his mental resting state, and so on for three more cycles. Just as Mingyur began the meditation, there was a sudden, huge burst of electrical activity on the computer monitors displaying the signals from his brain. Everyone assumed this meant he had moved; such movement artifacts are a common problem in research with EEG, which registers as wave patterns readings of electrical activity at the top of the brain. Any motion that tugs the sensor—a leg shifting, a tilt of the head—gets amplified in those readings into a huge spike that looks like a brain wave but has to be filtered out for a clean analysis. Oddly, this burst seemed to last the entire period of the compassion meditation and so far as anyone could see Mingyur had not moved an iota. What’s more, the giant spikes diminished but did not disappear as he went into the mental rest period, again with no visible shift in his body. The four experimenters in the control room team watched, transfixed, while the next meditation period was announced. As John Dunne translated the next instruction to meditate into Tibetan, the team studied the monitors in silence, glancing back and forth from the brain wave monitor to the video trained on Mingyur. Instantly the same dramatic burst of electrical signal occurred. Again Mingyur was perfectly still, with no visible change in his body’s position from the rest to the meditation period. Yet the monitor still displayed that same brain wave surge. As this pattern repeated each time he was instructed to generate compassion, the team looked at one another in astonished silence, nearly jumping off their seats in excitement. The lab team knew at that moment they were witnessing something profound, something that had never before been observed in the laboratory. None could predict what this would lead to, but everyone sensed this was a critical inflection point in neuroscience history. The news of that session created a scientific stir. As of this writing, the journal article reporting these findings has been cited more than 1,100 times in the world’s scientific literature. Science has paid attention. The next stunner came when Mingyur went through another batch of tests, this with fMRI, which renders what amounts to a 3D video of brain activity. 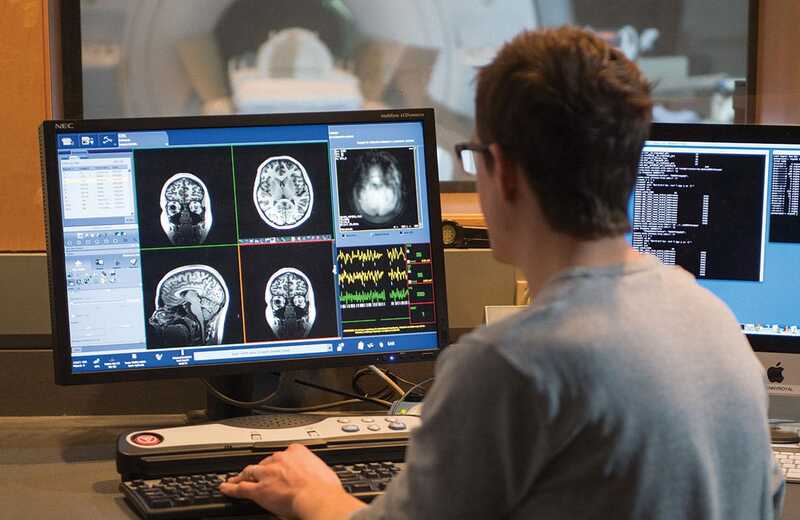 The fMRI gives science a lens that complements the EEG, which tracks the brain’s electrical activity. The EEG readings are more precise in time, the fMRI more accurate in neural locations. 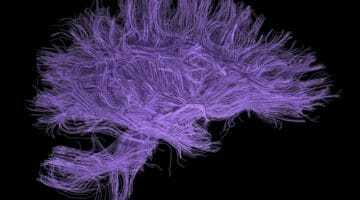 An EEG does not reveal what’s happening deeper in the brain, let alone show where in the brain the changes occur—that spatial precision comes from the fMRI, which maps the regions where brain activity occurs in minute detail. On the other hand, fMRI, though spatially exacting, tracks the timing of changes over one or two seconds, far slower than EEG. While his brain was probed by the fMRI, Mingyur followed the cue to engage compassion. Once again the minds of Richie and the others watching in the control room felt as though they had stopped. The reason: Mingyur’s brain’s circuitry for empathy (which typically fires a bit during this mental exercise) rose to an activity level 700 to 800 times greater than it had been during the rest period just before. 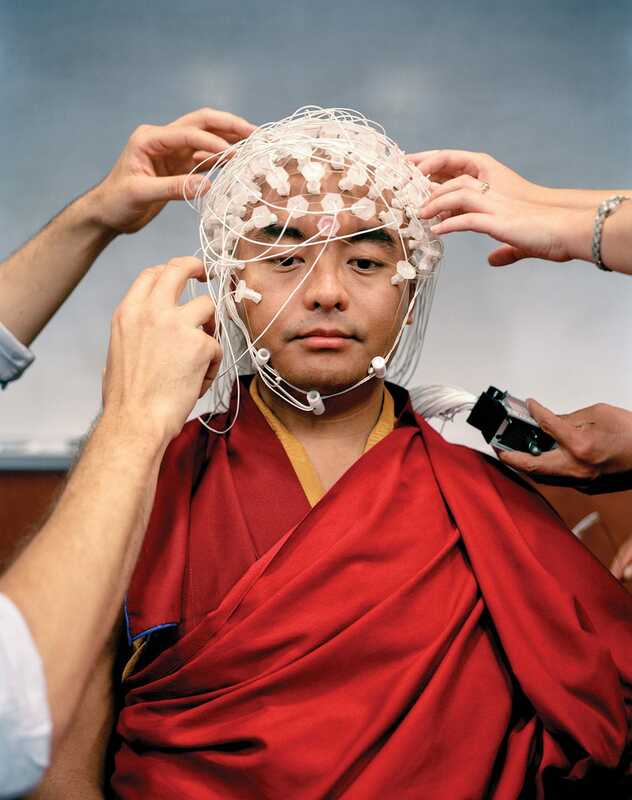 Data recorded during an electroencephalography (EEG) test of Buddhist monk Matthieu Ricard while he was meditating. Experts tested have logged between 12,000 and 62,000 hours of meditation. Photo by Jeff Miller, University of Wisconsin-Madison. Such an extreme increase befuddles science; the intensity with which those states were activated in Mingyur’s brain exceeds any we have seen in studies of “normal” people. The closest resemblance is for epileptic seizures, but those episodes last brief seconds, not a full minute. And besides, brains are seized by seizures, in contrast to Mingyur’s display of intentional control of his brain activity. While Mingyur’s visit to Madison had yielded jaw-dropping results, he was not alone. His remarkable neural performance was part of a larger story, a one-of-a-kind brain research program that has harvested data from these world-class meditation experts. Over the years in Richie’s lab, 21 Buddhist yogis have come to be formally tested. They were at the height of this inner art, having racked up lifetime meditation hours ranging from 12,000 to Mingyur’s 62,000. Such a feat of collective mental gymnastics has never been seen by science before. Each of these yogis completed at least one three-year retreat, during which they meditated in formal practice a minimum of eight hours per day for three continuous years—actually, for three years, three months, and three days. That equates, in a conservative estimate, to about 9,500 hours per retreat. All have undergone the same scientific protocol, those four one-minute cycles of three kinds of meditation—which has yielded a mountain of metrics. The lab’s team spent months and months analyzing the dramatic changes they saw during those short minutes in these highly seasoned practitioners. Like Mingyur, they entered the specified meditative states at will, each one marked by a distinctive neural signature. As with Mingyur these adepts have shown remarkable mental dexterity, with striking ease instantly mobilizing these states: generating feelings of compassion; the spacious equanimity of complete openness to whatever occurs; or a laser-tight, unbreakable focus. They entered and left these difficult-to-achieve levels of awareness within split seconds. These shifts in awareness were accompanied by equally pronounced shifts in measurable brain activity. Such a feat of collective mental gymnastics has never been seen by science before. Preparing the raw data on the yogis for sifting by sophisticated statistical programs has demanded painstaking work. Just teasing out the differences between the yogis’ resting state and their brain activity during meditation was a gargantuan computing task. So it took Richie and his colleague Antoine Lutz of the Lyon Neuroscience Research Center quite a while to stumble upon a pattern hiding in that data flood, empirical evidence that got lost amid the excitement about the yogis’ prowess in altering their brain activity during meditative states. In fact, the missed pattern surfaced only as an afterthought during a less hectic moment, months later when the analytic team sifted through the data again. All along the statistical team had focused on temporary state effects by computing the difference between a yogi’s baseline brain activity and that produced during the one-minute meditation periods. Richie was reviewing the numbers with Antoine and wanted a routine check to ensure that the initial baseline EEG readings—those taken at rest, before the experiment began—were the same in a group of control volunteers who tried the identical meditations the yogis were doing. He asked to see just this baseline data by itself. Twenty-one Buddhist yogis have been tested in Davidson’s lab. 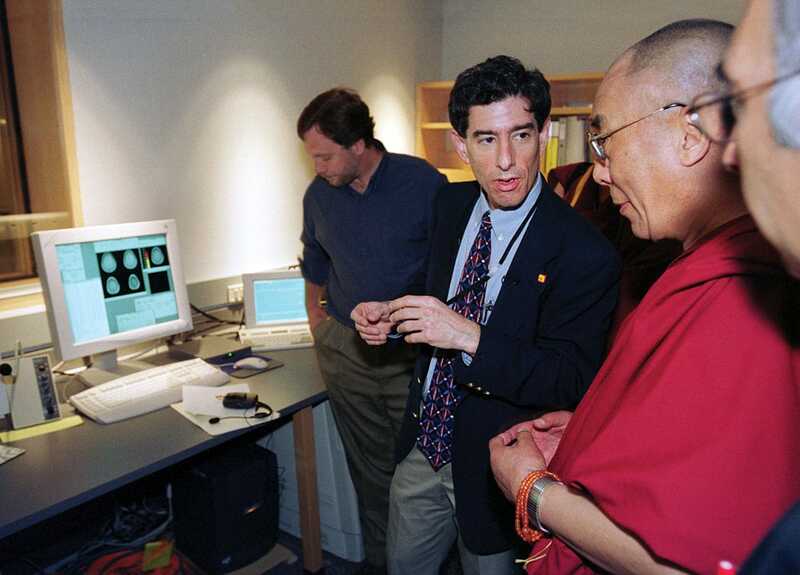 Here he explains how brain images are displayed to the Dalai Lama, who has long advocated the scientific study of meditation. Photo by Jeff Miller, University of Wisconsin-Madison. All the yogis had elevated gamma oscillations, not just during the meditation practice periods for open presence and compassion but also during the very first measurement, before any meditation was performed. This electrifying data was in the EEG frequency known as “high-amplitude” gamma, the strongest, most intense form. These waves lasted the full minute of the baseline measurement, before they started the meditation. This was the very EEG wave that Mingyur had displayed in that surprising surge during both open presence and compassion. And now Richie’s team saw that same unusual brain pattern in all the yogis as a standard feature of their everyday neural activity. In other words, Richie and Antoine had stumbled upon the holy grail: a neural signature showing an enduring transformation. There are four main types of EEG waves, classed by their frequency (technically, measured in Hertz). Delta, the slowest wave, oscillates between one and four cycles per second, and occurs mainly during deep sleep; theta, the next slowest, can signify drowsiness; alpha occurs when we are doing little thinking and indicates relaxation; and beta, the fastest, accompanies thinking, alertness, or concentration. Gamma, the very fastest brain wave, occurs during moments when differing brain regions fire in harmony, like moments of insight when different elements of a mental puzzle “click” together. To get a sense of this “click,” try this: What single word can turn each of these into a compound word: sauce, pine, crab? The instant your mind comes up with the answer, your brain signal momentarily produces that distinctive gamma flare. You also elicit a short-lived gamma wave when, for instance, you imagine biting into a ripe, juicy peach and your brain draws together memories stored in different regions of the occipital, temporal, somatosensory, insular, and olfactory cortices to suddenly mesh the sight, smells, taste, feel, and sound of that bite into a single experience. For that quick moment the gamma waves from each of these cortical regions oscillate in perfect synchrony. Ordinarily gamma waves from, say, a creative insight, last no longer than a fifth of a second—not the full minute seen in the yogis. Adepts showed remarkable mental dexterity, entering and leaving difficult-to-achieve levels of awareness within split seconds, accompanied by equally pronounced shifts in measurable brain activity. Such feats of collective mental gymnastics had never been seen by science before. Photo by Jeff Miller, University of Wisconsin-Madison. 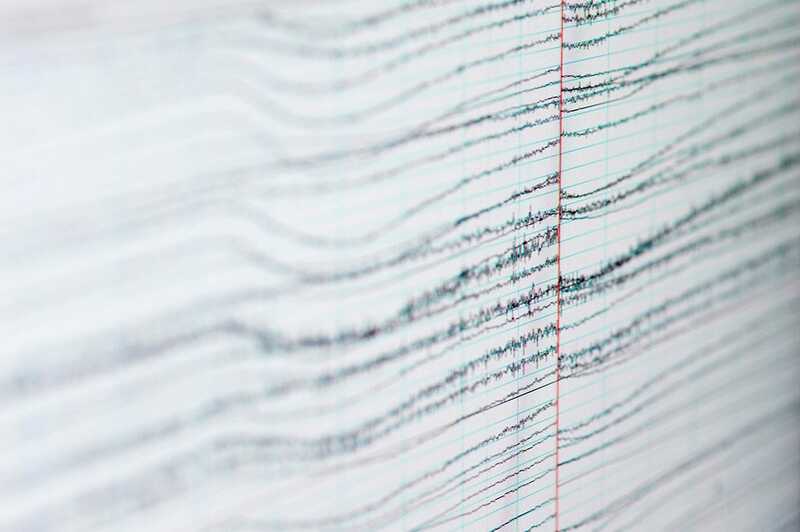 Anyone’s EEG will show distinctive gamma waves for short moments from time to time. Ordinarily, during a waking state we exhibit a mixture of different brain waves that wax and wane at different frequencies. These brain oscillations reflect complex mental activity, like information processing, and their various frequencies correspond to broadly different functions. The location of these oscillations varies among brain regions; we can display alpha in one cortical location and gamma in another. In the yogis, gamma oscillations are a far more prominent feature of their brain activity than in other people. Our usual gamma waves are not nearly as strong as that seen by Richie’s team in yogis like Mingyur. The contrast between the yogis and controls in the intensity of gamma was immense: on average the yogis had 25 times greater amplitude gamma oscillations during baseline compared with the control group. We can only conjecture about what state of consciousness this reflects: yogis like Mingyur seem to experience an ongoing state of open, rich awareness during their daily lives, not just when they meditate. The yogis themselves have described it as a spaciousness and vastness in their experience, as if all their senses were wide open to the full, rich panorama of experience. The gamma brain state Richie and Antoine discovered was more than unusual, it was unprecedented—a wow! No brain lab had ever before seen gamma oscillations that persist for minutes rather than split seconds, are so strong, and are in synchrony across widespread regions of the brain. Astonishingly, this sustained, brain-entraining gamma pattern goes on even while seasoned meditators are asleep—as was found by Richie’s team in other research with long-term vipassana meditators who have an average lifetime practice of about 10,000 hours. These gamma oscillations continuing during deep sleep are, again, something never seen before and seem to reflect a residual quality of awareness that persists day and night. The yogis’ pattern of gamma oscillation contrasts with how, ordinarily, these waves occur only briefly, and in an isolated neural location. The adepts had a sharply heightened level of gamma waves oscillating in synchrony across their brain, independent of any particular mental act. Unheard of. Richie and Antoine were seeing for the first time a neural echo of the enduring transformations that years of meditation practice etch on the brain. Here was the treasure, hidden in the data all along: a genuine altered trait. From Altered Traits: What Science Reveals About How Meditation Changes Your Mind, Brain, and Body by Daniel Goleman and Richard Davidson, published by Avery, an imprint of Penguin Publishing Group, a division of Penguin Random House LLC. Neuroscientist Richard Davidson is founder of the Center for Healthy Minds at the University of Wisconsin–Madison, where he has pioneered the study of how meditation practices affect the brain. He was recently elected to the National Academy of Medicine.